Granting medical supplies to nations in need. Many of us do our bit for recycling. We collect plastic containers, glass bottles, cans and scrap paper to be used again. We give our clothes to a secondhand store or a charity, and perhaps compost leftovers instead of tossing excess food in the garbage. But a Yonkers-based nonprofit has taken recycling to a whole new level. In 2010 alone, the Afya Foundation collected more than one million pounds of unwanted medical and humanitarian supplies, such as crutches, wheelchairs, hospital beds, IV kits, surgical bandages, sutures, skin dressings and anesthesia machines. Instead of winding up in dumps and landfills, these items were sorted, boxed and shipped to developing countries in Africa, Asia, South America and the Caribbean, where they were put to immediate use to alleviate suffering and save lives. Afya began in 2007, when what was intended as a vacation to Tanzania became a life-changing experience for Danielle Butin, an occupational therapist who teaches at Columbia University and formerly ran the Medicare divisions of Oxford and United Healthcare. Shocked and moved by the medical need she observed, Butin felt compelled to take action. Butin set out to send unwanted supplies where they were desperately needed. Thus, Afya— “good health” in Swahili— was born. Early in 2008, the organization shipped its first container to Haiti and Dr. Paul Farmer’s renowned group Partners in Health. That was two years before the disastrous Haitian earthquake, an event that forced Afya to learn how to respond quickly in a crisis. Within days, the first of 28 40-foot containers full of mattresses, blankets, pillows, surgical packs, respirator masks and backboards was en route. When massive floods inundated Pakistan in July 2010, Afya responded quickly once again. More recently, the earthquake and tsunami in Japan inspired a partnership with Zaro’s Bakery to solicit donations at its Grand Central and Penn Station locations in New York City. The money collected there and from other generous donors helped Afya gather and ship thousands of pounds of urgently needed materials. Butin’s organization depends on a network of donor hospitals, health organizations, corporations and individual households. Staff members and volunteers are also crucial. A tiny paid staff and legions of volunteers of all ages fill its huge warehouse day after day with laughter, energy and good will. Afya’s volunteers are the heart of the organization. 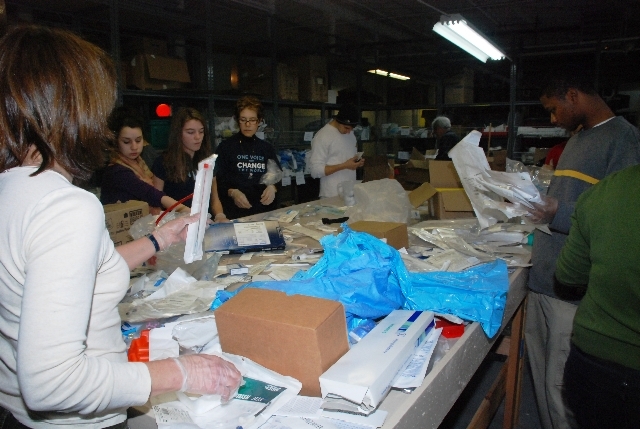 On a typical morning during the early spring, dozens of teenagers from Heschel High School in Manhattan and a small group of adults from the Riverdale Mental Health Association sorted and packed mountains of medical supplies bound for a floating clinic in Lake Tanganyika, Tanzania. Meanwhile, a midwife preparing to take three NYU students to Haiti collected the equipment for her team. In the afternoon, a group of surgeons and anesthetists with the Health and Humanitarian Aid Foundation (HHAF) chose items for a trip to Ghana. Afya’s volunteers come from diverse walks of life. They are students of different races, religions and ethnicities, as well as doctors, nurses, teachers, parents, children and members of at-risk populations. Volunteers are encouraged to take leadership roles and start their own initiatives. The boys from Children’s Village in Dobbs Ferry work at the warehouse regularly and, because of their enthusiasm and muscle power, are in charge of loading the big truck. A Philadelphia schoolteacher organizes a fundraising dinner. A family donates a wheelchair and a walker after the death of a grandparent, allowing the equipment to have a new life helping someone else. Iris Hiskey Arno is a children’s book author, a journalist, a musician and a volunteer at the Afya Foundation.